Varicose veins are swollen, over-stretched veins. You can see and often feel them lying just under your skin, usually in your legs. Although some people don’t like how varicose veins look, for most they don’t cause any symptoms or problems. If you do have symptoms there are a range of treatments that can help. Varicose veins develop when blood doesn’t flow properly through the veins in your legs. There are two main types of veins in your legs: superficial veins near the surface and deep veins within your muscles. In healthy veins, blood flows from the superficial veins to the deep veins and from there back up to your heart. 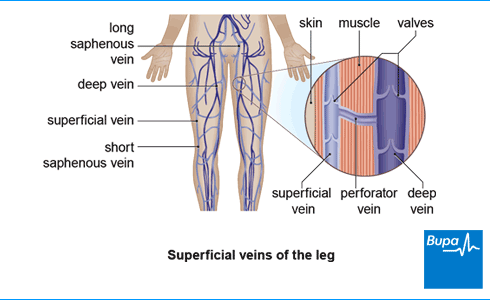 The superficial veins are connected to the deep veins inside your legs by perforator veins. Varicose veins are a sign of high pressure in your leg veins. Normally, one-way valves inside all these veins make sure that your blood goes in the right direction. If the valves stop working as they should, the blood pools in the veins in your legs. This increases the pressure inside the veins causing them to swell, and making more valves likely to fail. If the valves in the superficial venous system have failed, this leads to visible varicose veins. Some people are born with conditions that cause them to have veins with walls that are unusually thin and week. This can cause them to develop varicose veins even when their veins are under normal pressure. See our section on causes of varicose veins for more information about who gets them. It’s possible for varicose veins to bleed, but in most people they don’t. If you have any bleeding, contact your doctor. You may find your symptoms are helped by putting your leg up or by walking. For women, symptoms can be worse during periods or pregnancy. These symptoms may be caused by problems other than varicose veins. If you have any of these symptoms, contact your GP for advice. Your GP will ask about any symptoms you have and ask to examine you, including while you’re standing up. They may also ask you about your medical history. If your symptoms are severe or you have complications, your GP may refer you to a vascular surgeon (a doctor who specialises in blood vessels). If your varicose veins aren’t causing you any trouble – but you want to have them removed because of how they look, your GP can refer you for treatment privately (ie not on the NHS). Varicose veins are usually easy to see in your leg. If you’re referred, as well as examining you, your doctor may suggest that you have a special type of ultrasound scan called a duplex ultrasound. This uses sound waves to produce an image of the veins inside your leg and the flow of blood through them. It allows your doctor to see your deep veins in more detail, and find out more about the position and extent of your varicose veins. It also helps your doctor to rule out a blood clot as the cause of any symptoms. Your GP may do a duplex scan if they think this could be a possibility. If your job involves a lot of standing, try to change position frequently and move around as often as you can. Moving your feet and legs will help with muscle tone and blood flow. When you sit down, don’t cross your legs because this can restrict your blood flow and circulation. Try to take regular breaks throughout the day and, if possible, keep your legs raised on something comfortable while you’re resting. If you’re pregnant and have developed varicose veins, they’ll often improve after you have your baby. Compression stockings may also help to relieve any swelling and aching in your legs. There are a number of options for treating varicose veins. The type of treatment that you’ll be offered will depend on the results of your duplex ultrasound (see Diagnosis, above, for more information). Your doctor will discuss your options with you so you can make a decision that’s right for you. See our pros and cons section below for more information about each treatment. If your varicose veins don’t cause you any discomfort, you may decide not to have any treatment. If you want your veins treated for cosmetic reasons, it’s unlikely you’ll be able to have this on the NHS. However, you can choose to pay for treatment privately. Most varicose veins don’t cause any long-term health problems or threat to your circulation. It’s worth considering that, even after treatment, your varicose veins may come back. You may be offered a further procedure if this happens. Ask your doctor what the chance of your varicose veins coming back is. There are several types of non-surgical procedures available to treat varicose veins. These treatments block the affected veins, but this doesn’t damage the circulation in your legs as other veins take over. If you have one of these procedures, you’ll need to wear compression bandages, with a compression stocking over the top for five days afterwards. After this, you should wear the compression stockings for a further seven days, taking it off to shower or at night if you need to. You may also be given a small injection of an anti-coagulant medicine in your tummy to stop any blood clots forming. Endothermal ablation means heating the inside of your varicose vein to make it close off. Your doctor uses either radiowaves (radiofrequency ablation) or a laser (endovenous laser ablation) to create the heat. Endothermal ablation is a less invasive alternative to traditional surgery for varicose veins (see below). The treatments work as well as surgery and you’re likely to recover more quickly with less pain, so doctors usually offer these treatments first. They can be carried out under local anaesthetic, which means you’ll be awake, but the area around your vein will be numb. The local anaesthetic will be injected along the course of your vein. It may sting a little, and although uncomfortable it doesn’t last long. Your doctor will make a tiny cut in your vein and insert a fine tube (catheter) into it. A device at the tip of this tube creates heat that closes off your varicose vein. You’ll usually be encouraged to be up and about afterwards, and home the same day. There’s more information about the benefits, side-effects and complications of radiofrequency ablation and endovenous laser ablation in our pros and cons section below. You can ask your doctor to explain these. If endothermal procedures are unsuitable for you, your doctor may recommend you have foam sclerotherapy. To have this treatment, a chemical foam is injected into your varicose veins. This damages the inside of the veins, causing them to close up. Foam sclerotherapy may help to get rid of your varicose veins, although you may need more than one injection to block each vein. Like the endothermal procedures, it’s less invasive than surgery and can be done under local anaesthetic. Your doctor will talk to you about the benefits and risks of this procedure, and there’s more information in our pros and cons section below. If less invasive procedures are unsuitable for you, your doctor may suggest you have varicose vein surgery. During the operation, your surgeon will remove any superficial veins that have become varicose veins. Your deep leg veins will take over the role of the damaged veins so the blood flow in your leg won’t be harmed. The most common technique for varicose vein surgery is called ligation and stripping. You usually have general anaesthetic, which means you’ll be asleep during the procedure. In this operation, your surgeon will make a small cut in your groin so they can access the faulty vein. Using special equipment they’ll tie off the vein (ligation) to stop blood flowing through it and then remove it with a long wire (stripping). Your surgeon may also suggest that you have a procedure called phlebectomy to remove veins on the surface of your leg. To do this, your surgeon will make small cuts over the veins and use hooks to pull them out. Phlebectomy can also be done as a separate procedure, under local anaesthetic. You’ll be awake during the procedure, but the area around the vein will be numb so it won’t be painful. You usually go home the same day after varicose vein surgery, although you may stay overnight in hospital. Your leg may feel sore and uncomfortable for up to two weeks after your operation. You may need to be off work for between one and three weeks. Your doctor can advise what’s best for you. Although many people won’t need any further treatment after surgery, it’s possible that new varicose veins can form. If you want to know more about the risks of varicose vein surgery ask your doctor, and see our section on pros and cons below. If the treatments above aren’t suitable for you, or you choose not to have them, your doctor may suggest you try compression stockings to help relieve the swelling and aching in your legs. Your doctor may also suggest compression stockings if you have varicose veins and are pregnant. If you have a procedure to treat your varicose veins, you’ll also need to wear compression stockings afterwards to prevent blood clots forming in the veins of your legs. Here we summarises the benefits and risks (pros and cons) for each of the treatment options for varicose veins. When looking through these, think about what matters most to you. Your doctor will discuss these with you to help you decide which is right for you. You don’t have to worry about getting any side-effects of treatment. Following all the suggestions for self-help may stop your varicose veins from getting worse. Your varicose veins won’t go away on their own and may worsen, despite self-help measures. If you’re in pain or don’t like the look of your varicose veins, this might not be an option for you. This isn’t a major procedure and you’re likely to recover more quickly than with surgery. You won’t need to have a general anaesthetic. Instead, you can just have a local anaesthetic which numbs the area being treated. For most people, RFA works as well as surgery at treating varicose veins. You’re likely to have less bruising and swelling and will probably have less pain in the days after the procedure. Not everyone will be able to have this procedure. Your doctor will be able to tell you whether this treatment is suitable or not. You may need more than one treatment to successfully treat your varicose veins. Some people have pins and needles and bruising after the treatment. This is more common if you have treatment below the knee. Around one in 10 people have inflammation of the treated vein but this should get better within a month of having treatment. This isn’t a major procedure and you’re likely to recover more quickly than with surgery. You won’t need to have a general anaesthetic. Instead, you can just have a local anaesthetic which numbs the area being treated. For most people, laser ablation works as well as surgery at treating varicose veins. You’re likely to have less pain after the procedure than if you have normal surgery. Not everyone will be able to have this procedure – but most will. Your doctor will be able to advise you on whether this treatment is suitable or not. This is a fairly new treatment so we can’t be sure yet how well it works in the long term. You may get some darkening or redness of your skin and inflammation of the treated vein, causing a feeling of tightness in your leg for a couple of weeks after treatment. Some people develop pins and needles afterwards, but this is not permanent. You won’t need to have a general anaesthetic for this procedure. Instead, you can just have a local anaesthetic, which will numb the area being treated. You may be able to have this procedure if you’re not fit enough for other types of treatment. This is a fairly new treatment so we can’t be sure yet how well it works in the long term. However, so far it seems to work as well as normal surgery. You may have some bruising, swelling and notice some changes to the colour of the skin over your veins. This is quite common. The changes to your skin are usually permanent, but can fade over time. If the foam misses the vein, it can cause small ulcers on your skin. These may take a couple of weeks to heal and could leave a scar. Other side effects may include temporary visual problems, coughing and headache – although these are rare. Make sure you discuss possible side-effects and complications with your doctor. You may not be able to have this type of treatment if you have a history of blood clots. There are other reason why you might not be able to have foam sclerotherapy. For more information, speak to your doctor. A few people have had serious complications after this procedure including strokes, mini-strokes or heart attacks. There may well have been particular medical reasons why this happened to them. If you would like more information about this, speak to your doctor. We know this treatment works well – it’s the most ‘tried and tested’ way to remove varicose veins. You’ll usually have this type of surgery under a general anaesthetic, so that you’ll be asleep during the operation. As it is an operation, it may take you longer to recover (up to three weeks). You may have some bruising after the procedure or complications such as damage to nerves in your leg – causing groin pain, infection or bleeding. There’s also a risk that the varicose veins will come back. For more information about complications, speak to your doctor. This procedure is quick and effective. It leaves only small scars and no skin staining or other potential complications of foam sclerotherapy like skin ulceration. If you get varicose veins during pregnancy the good news is that they usually get better within three to 12 months of your baby being born. Some people get varicose veins because of a condition that they’ve had since birth, such as Klippel-Trenaunay syndromes or avalvulia. For more information, speak to your doctor. Varicose veins can get worse over time, but this usually happens slowly over a period of years. Some people develop skin changes after they’ve had varicose veins for some time. These usually occur in your lower leg or ankle and are caused by the increased pressure in your veins. Your skin may become brown or purple and you may develop a rash (varicose eczema). More serious complications are rare but can include the following. Thrombophlebitis – your superficial veins can become painful and red due to a blood clot forming in the vein. Bleeding – your varicose veins can bleed if you cut or bump your leg. This will stop with firm pressure but your vein may need to be treated to stop it happening again. venous ulcers – small cuts or wounds on your skin can take longer to heal if you have varicose veins, and sometimes they don’t heal at all, forming an ulcer. Deep vein thrombosis (DVT) – people with varicose veins are more at risk for DVT but it may also happen after treatment. Your calf may swell and become painful, and you should seek medical help right away. See our FAQs below for more information. If you have any of these complications, see your GP. There are no scientifically proven ways to prevent varicose veins. But there are things you can do to make them less likely to develop and stop any you do have from getting worse. The following suggestions may be useful. Don’t stand or sit still for long periods of time. Put your feet up from time to time. Ask your practice nurse for advice if you need help choosing the best type of exercise or about how to lose weight. You may also find it helpful to read our blog for helpful tips on weight loss . Can my doctor give me medicines to treat my varicose veins? Can my doctor give me medicines to treat my varicose veins? Over the years, many different medicines and creams have been tested for the treatment of varicose veins. But there’s no evidence to suggest that any of these work. Forty years ago there was a small clinical trial in women with varicose veins. This showed that a medicine called rutoside can reduce symptoms such as night cramps and feelings of tiredness. We would need a lot more research in more people before we could say whether it really does help. There’s also no evidence to suggest that herbal creams, lotions and other medicines for poor circulation work for varicose veins. Always ask your doctor or pharmacist for advice. If you do decide to take medicines or use creams, read the patient information leaflet that comes with your medicine carefully. Am I more likely to develop a DVT if I have varicose veins? Am I more likely to develop a DVT if I have varicose veins? Varicose veins increases the risk of developing a blood clot in a deep vein (deep vein thrombosis, DVT). But most people with varicose veins won’t develop this complication. Having varicose veins has also been linked with an increased risk of developing a DVT in some studies. However, if there is a risk, it appears to be very small compared with other risk factors. Getting a DVT can also be a complication of procedures and surgery for varicose veins. If you have varicose veins, and are worried about your risk of developing DVT, talk to your doctor. The signs of a DVT are redness, pain and swelling in your leg. If you have these symptoms, contact your doctor straight away. My skin is really dry and itchy. What can I do? My skin is really dry and itchy. What can I do? If you have varicose veins for some time, you may find that the skin of your lower leg becomes dry, scaly and very itchy. This is caused by fluid leaking out of the affected veins and causing changes in your skin. The skin may also change colour, become flaky or inflamed. This condition is called venous or varicose eczema. You can ease the itchiness and discomfort by applying emollients (special moisturisers) at least twice a day. You can buy these from your pharmacy or your GP may prescribe them for you. They will help keep your skin soft and supple, and stop it breaking down. Don’t use bubble bath or soap on the area as it can be very drying. You can put the emollient in the bath water (but be careful – it can make the bath very slippery). If your skin becomes inflamed your GP may prescribe a steroid cream to put on the area. Do follow the instructions the GP or pharmacist gives you about how to use it. You also need to be careful not to knock or damage your skin. Skin affected by varicose eczema is very delicate and can break easily. A break in the skin could cause a venous ulcer to start and they can take a long time to heal. You can reduce your risk of getting varicose eczema. Make sure you don’t stand in one position for too long, keep active and lose excess weight. When you’re resting, try to put your feet up so they’re a little higher than your heart. See our section on self-help for more information. If the affected skin becomes hot and inflamed, or you get a high temperature and feel unwell, see your GP. You may have an infection and need antibiotics. Ask your GP whether having your varicose veins treated would be a good option for you. See our treatments section above for more information. Deep vein thrombosis (DVT) is a condition in which a blood clot forms in one of your deep veins. Nesbitt C, Bedenis R, Bhattacharya V, et al. Endovenous ablation (radiofrequency and laser) and foam sclerotherapy versus open surgery for great saphenous vein varices. Cochrane Database of Systematic Reviews 2014, Issue 7. Art. No. : CD005624. DOI: 10.1002/14651858.CD005624.pub3.